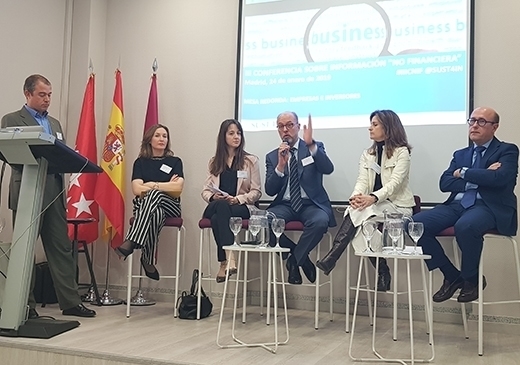 This conference was held under the framework of the new 11/2018 Law published on December 28, a new transposition of the European Directive 2014/95/UE on the Disclosure of Non-Financial and Diversity Information, which is already in effect in our country. This new law, which is applicable to information that will be published about 2018, refers to the minimum content to be published on companies’ non-financial information, and it also affects businesses that meet two of the following circumstances: having more than 250 employees, having more than €2 million total in recorded assets, and a net sum of more than €40 million for the business’s annual turnover. Ana Peña, Head of Quality, Environment, and Climate Change at Ferrovial, participated in the panel entitled “Businesses and Investors,” and the panel’s debate revolved around Spanish leadership on publishing non-financial information, even though it was also pointed out that this law is helping model and standardize information. During her opening speech, Ana Peña presented Ferrovial’s case as a success story, given that the company integrates financial and non-financial information in a way that also incorporates recommendations from the TCFD (Task Force on Climate-related Financial Disclosure). Particularly because of the value that being on sustainability indexes, such as DJSi, FTSE4Good, and CDP, brings to the company, along with the importance that analysts and investors place on public information, information regarding the environment and Climate Change is disseminated in Climate Strategy Reports and on Ferrovial’s website.